The Outback Two-Story Apartment Hutch is a two-story wooden pet hutch made with quality workmanship. 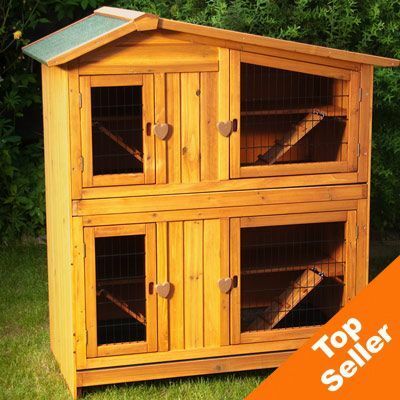 The hutch is ideal for keeping multiple pets separated from another. Both levels are identically laid out and equipped. The hutch is divided into two areas and two stories that are connected by ramps. The lower area of each story is connected by an opening. Both hutch areas can be reached and easily cleaned through a wire door. Both levels are equipped with a finely meshed removable floor. A plastic removable drawer makes cleaning the hutch easy. The hutch is completely weatherproof due to the special weather-treated wood. Dimensions L 117.5 x W 70.3 x H 129.5 cm (incl. peak of roof) Roof Height Left 115 cm Roof Height Right 112.5 cm Inner Passage 16 x 28 cm Overhang approx. 6 cm Please Note Without care timber may dry out and become brittle warped or shabby. Please ensure your pet home is regularly cleaned and treated. We recommend treating dens and houses which will be used outside with wood care and impregnating products. Always make sure products used are suitable and harmless for pets. Placing the pet home in a sheltered spot will also help to reduce wear. This product cannot be delivered to Northern Ireland. Please note the dimensions given also include the roof and not only the body of the hutch.